I know that I am supposed to be making the Hunstanton print cotton into a dress – but I got sidetracked. For a long time now I have been looking at the flooring of our bathroom and thinking that it is an ideal pattern for patchwork. Last year whilst on holiday in Cornwall I visited Butterfly Quilters in Kilkhampton and invested heavily in the purchase of lots of Blue-toned fabrics with a view to making up a quilt inspired by the bathroom floor! Well I have finally made a start. 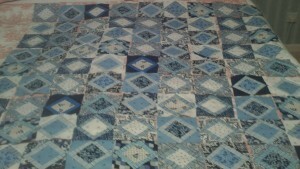 The basic design is of 3″ squares bordered with 1″ strips of striped fabric to make a 5″ square which is then joined to another 5″ square using the “magic” technique to produce a 6+1/4″ pieced block. As the resulting block has 4 triangles at the outside, all with bias edges I have found it best to “tame” the blocks by using straight grain sashing and cornerstones. I have made up the 81 blocks, cut 200 pieces of sashing and 100 cornerstones so now just the time-consuming task of piecing all together before adding 2 borders which will complete the top of the quilt. auditioning the completed blocks before adding sashing & cornerstones.